Pre-Defined chat messages / replies to frequent questions. If the automated reply system isn’t for you, we offer another solution to answering common questions. 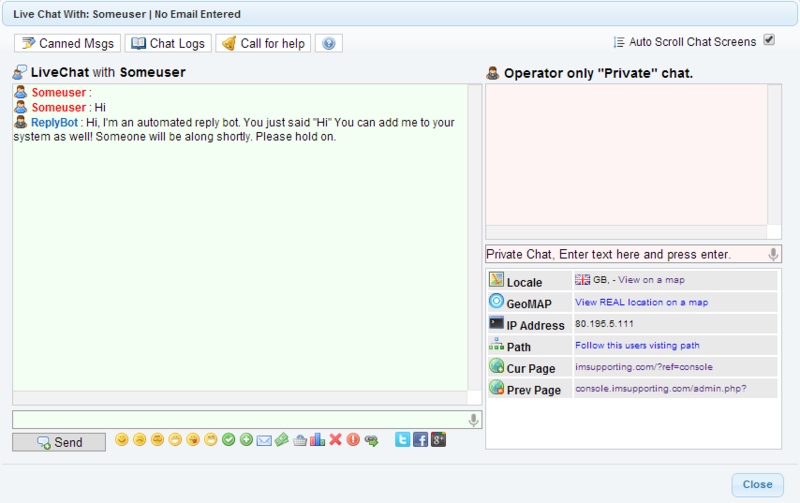 This comes in the form of live chat Canned Responses, sometimes known as canned messages or canned replies. With canned responses, the live chat software allows you to set up answers to the most common questions. You and your operators can then simply click the “Canned Msgs” button in chat and select one of these pre-defined answers to instantly reply to the user in chat. This not only helps give users an answer quickly but it also helps you as a business to give a clear and concise answer each and every time.